The Cinerama’s Saturday Classics series concludes this weekend with the laser projection of 1955’s smash hit musical Oklahoma!. The following is the review I wrote of the film last year, after finally bringing myself to watch it all the way through. Richard Rodgers and Oscar Hammerstein II are generally credited with ushering in a Golden Age of musical theatre, this 1943 play marking the first truly integrated show, with music, lyrics and story seamlessly interwoven. Of course it wasn’t the first (Show Boat did much the same thing 15 years earlier, to say nothing of the operettas from the 19th century onward that did as well, but whatever), but it was a huge hit, inspiring many imitators, some of which are actually good. 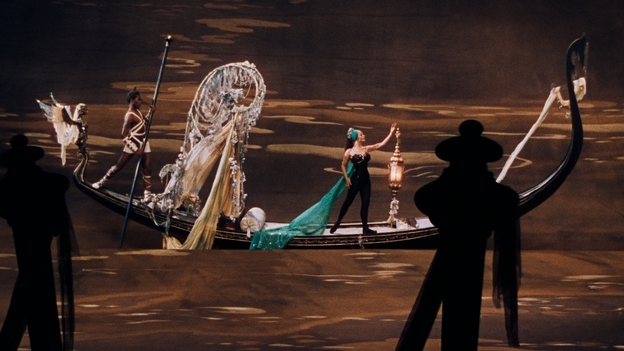 Similarly, the 1955 film adaptation was followed by a new form of musical film: more or less direct translations of stage musicals, often excruciatingly long, presented as roadshow extravaganzas (more expensive tickets, super widescreen formats, elaborate sets and locations). These films, increasingly bloated and dull, eventually killed the musical as a viable American film genre and played no small role in bankrupting the studio system that had been in place in Hollywood since the 1920s. After the smashing success of 1948’s The Red Shoes, with its lengthy fantasy ballet sequence fusing the stage arts with effects possible only in cinema, the writing-directing-producing team of Michel Powell and Emeric Pressburger wanted to make a truly operatic film. In 1951, they adapted Jacques Offenbach’s mostly-finished fantasy opera The Tale of Hoffman, adapted from three stories by writer ETA Hoffmann. Truly pan-European in concept, it’s an English film adapting a French variation on an Italian art form based on stories from a German author drawing on Central European folk traditions (whose story The Nutcracker is also the basis for the most famous of all Russian ballets). The film is entirely dialogue-free, every line sung in an English adaptation of Offenbach’s score by opera professionals, all pre-recorded with the film edited to match the score (all but two of the actors are dubbed, only star Richard Rounseville and Ann Ayars sing their own parts). Divided in three sections with a frame story, Rounseville plays Hoffmann, who is in love with a ballerina named Stella (Moira Shearer, star of The Red Shoes). During an intermission in her performance, he goes to a bar and gets drunk, telling an assembly of students stories of his three past loves gone wrong. Those stories, about women named Olympia, Giulietta and Antonia, are then dramatized as operettas within the whole. This week, the Cinerama is playing what they’ve dubbed their “First Mixed Martial Arts Festival”, a collection of movies, Hong Kong and Japan mostly, in which kicking, punching and/or swordplay is prominently featured. Playing two or three different movies per day, mostly DCP but with some 35mm, its an eclectic mix of masterpieces, curiosities and what amounts to an almost-complete Bruce Lee retrospective. I don’t think I’ve ever been as mixed about a film series as I am about this mixed martial arts series. On the one hand, and probably most importantly, there are a bunch of great movies playing here, included some films that haven’t played in Seattle since the heyday of Landmark’s Hong Kong repertory run in the mid-1990s. The chance to see Bruce Lee, Jackie Chan, Toshiro Mifune, Stephen Chow and Jet Li in that gorgeous Cinerama environment is not to be dismissed lightly. Even under less than ideal conditions, like digital projections of DCPs and Blu-Rays, seeing these films is a treat. But there appears to be no rhyme or reason to the way this festival was put together, with many of the best films showing at the most inconvenient times, no clear threadlike connecting the films from different countries or eras and a lot of sub-standard source material for a repertory festival.